Oval trampolines seem to confuse people… questioning are they a rectangle or round? Well, they’re both! But what makes the oval range different from Springfree’s round or square? The size of your garden does depend on what shape of trampoline you buy. But if your concerned about safety, our oval range of Springfree trampolines have the same parts, materials and warranty so rest assured your protected which ever you go for. Springfree trampolines come in 2 sizes… 8 x 11ft Medium Oval and 8 x 13ft Large Oval. So, going back to the size of your garden… there may seem like there’s only 2 feet difference between the two but actually, you gain 15square foot more! Who knew?! Ideal for two bouncers. 2 Children or if Mum and Dad fancy a bounce! Our Ovals have 2 bounce spots designed into the trampoline which creates a safer bouncing area and you won’t feel like you’re being pulled into the centre. They’re a great shape for long gardens. If your garden is longer than it is wider, the ovals fit in nicely. You maximise your bouncing area and wasting less space around the trampoline. Out of all our shape and model trampolines, it’s an oval-ly great shape for the average family! We whilst we must practice safety, measuring your garden and knowing which shape oval trampoline is best for you matters… Here’s more information on Springfree’s two ovals. Our Medium Oval has the size of a traditional trampoline but just a different shape! It’s the perfect shape of trampoline to fit into any garden whether yours is wider than longer or the opposite way around, this tidy shape of trampoline is ideal. With the jump mat being 2.4 metres in diameter by 3metres, your total clearance space needed is 4.4 metres by 6 metres. And sure, not all our gardens are the size of a football pitch but it’s not a huge area you’ll be missing out on. 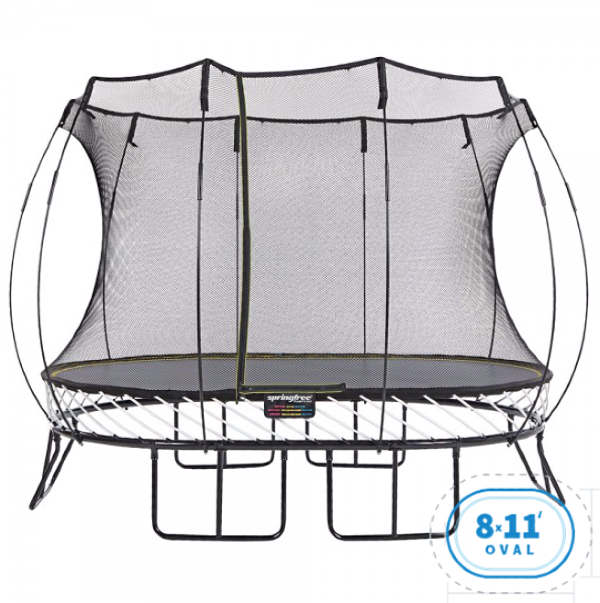 Having the extra metre on each side of the trampoline gives space for the flexi-rods surrounding the enclosure net, to flex out if an energetic bouncer was to fall into the net. 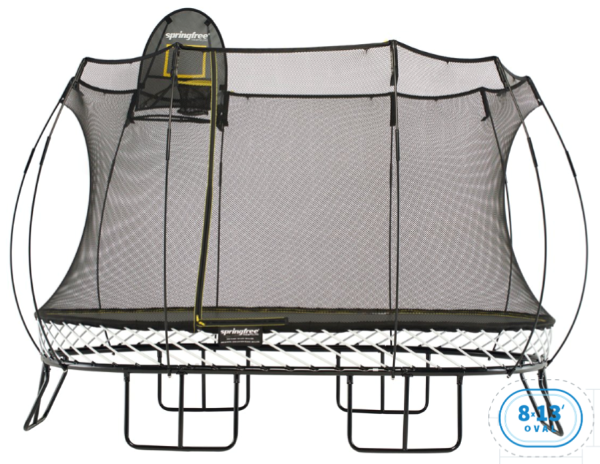 This trampoline is ideal for any age child or adult and gives the right amount of space for two bouncers. Our Large Oval trampoline may look the same as our medium, may have the same bounce spots but actually, it’s a whole different trampoline in itself. Having an extra 15 square foot bigger bounce space and the littlest price tag between, your upgrading your Springfree to a whole new level! And… it’s just as safe! The jump mat is 2.4 metres by 4 metres so in total, your clearance space required is 4.4 metres by 6 metres. But is it really about size? With the ovals, Springfree says yes! Worried about your children growing out of their trampoline? … Go for the Large Oval. With that 15square foot more space you can put your troubles at bay. So before deciding which oval trampoline you like the look of, make sure you follow these guidelines to ensure you have a safe and fun jumping experience. Check out the other trampolines in our range here on our website. Call us today on 01276 477461 and our customer service team can talk you through which oval trampoline suits your family!